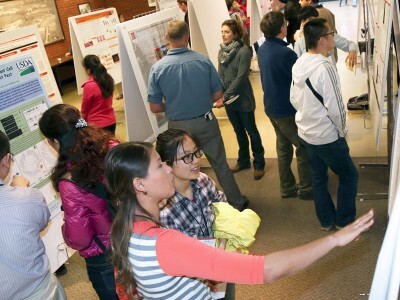 OARDC's 2014 Annual Research Conference, held April 24 in Wooster, focused on the theme "From Biology to Business -- The Transformational Power of Big Data." The program featured speakers from CFAES, Purdue University, and Ohio State's colleges of Public Health and Arts and Sciences. It also included the presentation of the following annual awards. Sandra Velleman helps turkeys and the industry around them get stronger. A scientist in the Department of Animal Sciences, Velleman studies the genetic and cellular mechanisms governing how turkey muscles grow and develop -- key to improving the birds' growth rate, keeping them lean and raising them efficiently for food. Luis Rodríguez-Saona, Department of Food Science and Technology, is a national and international expert on using infrared spectroscopy to analyze the safety and quality of foods. "His research accomplishments have produced significant improvements in rapid detection of quality traits and safety of agricultural products, as well as in disease detection," a nominator wrote. Ahmed Yousef, Department of Food Science and Technology, developed a new process to pasteurize eggs in the shell and discovered two new antimicrobial agents for fighting foodborne pathogens. The new process uses mild heat and pressurized ozone. It can eliminate Salmonella and other pathogens in egg contents and on egg surfaces. Timothy J. Hackmann was honored for his paper "Quantifying the Responses of Mixed Rumen Microbes to Excess Carbohydrate," which appeared in April 2013 in the journal Applied and Environmental Microbiology, published by the American Society for Microbiology. Now an assistant professor at the University of Florida, he received his Ph.D. last year through Ohio State's Interdisciplinary Ph.D. Program in Nutrition. Sarah McNulty (first), Wenshuang Xie (second) and Nuris Acosta (third) in the research assistant and associate category. Get details here on the winners' topics, departments and advisors.